V-Lazer's chain of food supermarkets started in 1999. The first store opened in Ussuriysk. 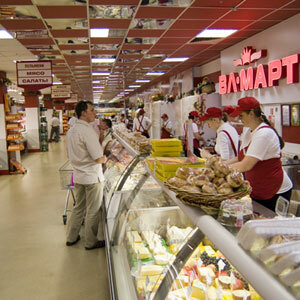 Then the store opened in Bolshoi Kamen, Vladivostok, Nakhodka, Partizansk, Fokino, Arsenyev. The food stores chain was managed by VL-Prioduct Company and they worked under the same name together with home appliances stores (V-Lazer). In January, 2006, V-Lazer Group Management made a decision to give the food stores their own name - VL-MART. Since that, VL-Mart Company started to operate the food stores chain within V-Lazer Group. All the stores with the chain are fit with the most up-to-date sales and process equipment. The range of products is about 25 thousand items. Besides food products and beverages and alcohol, the supermarkets also display a wide range of accompanying goods: perfumes, cosmetics, household detergents, dishware, gifts, children's toys, haberdashery and many other things. That's why VL-MART stores can be called universal. VL-MART leadership has developed a unified standard for all the chain stores. Regular trainings are provided to the personnel. Once a year employees prove their qualification level through an evaluation procedure. Due to this, the service in VL-MART supermarkets is at the highest level. At this time, VL-MART supermarkets chain works directly with many well-known national and foreign producers and suppliers. Since the procurement for food products is centralized, this increases purchase amount that is an important factor for producers and suppliers. The stores' achievements were awarded many times. VL-MART supermarkets chain continuously improves. The Company plans to open more new up-to-date store.